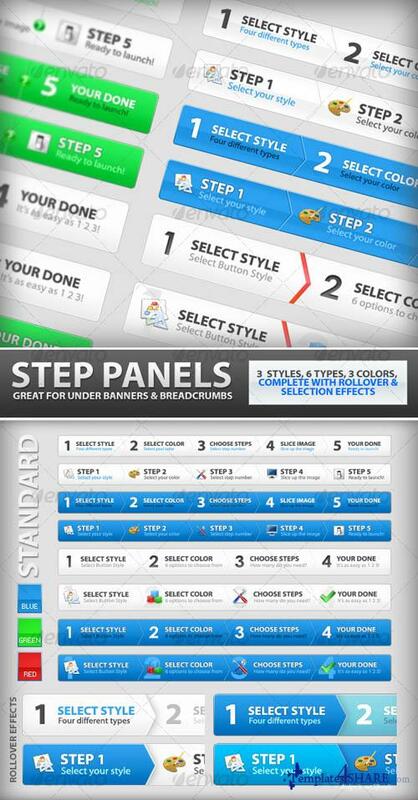 These panels are comprehensive and flexible with 3 styles: Standard, Big Arrow, and Little Arrow 3 color options: Blue, Red, and Green, and four variations of both the 4 and 5 step processes. A video is also included to show how to use and modify the files. The video also provides some insight into how to easily modify the color and width of the panels. ADDED BONUS : 'Plastic' versions of ALL the designs provides that clean mac-style without having to re-style anything. This addition makes the set truly flexible and ready to fit almost any design.